Ward Law Office registered patent attorney Jacob Ward presented information about intellectual property during the “Patently Good Ideas: Intellectual Property Law for Business and Entrepreneurs” event Wednesday at the Wapakoneta Chamber of Commerce office. WAPAKONETA — Registered Patent Attorney Jacob Ward discussed the importance of intellectual property during the “Patently Good Ideas: Intellectual Property Law for Business and Entrepreneurs” event Wednesday at the Wapakoneta Chamber of Commerce. Ward described intellectual property as the inherent value associated with the work of an individual or employer. There are four types of intellectual property: trademarks, copyright, trademark secrets and patents. A trademark is an image or logo that helps distinguish a product and becomes a source identifier, according to Ward. Although employers and entrepreneurs are not required to register a trademark, Ward suggests that they do. The benefits of registering a trademark is that it will give it national coverage. Trademark registration is available at uspto.gov. When choosing a trademark, Ward suggests one that it is fanciful or coined or arbitrary as opposed to one that is suggestive or descriptive. Unlike the trademarks which are source identifiers, copyright protects the work of authors, such as books, magazines, music and plays. Protection exists immediately upon creation of the work and is good for the author’s lifetime and 70 years after, according to Ward. Copyright prevents the derivative or an author’s work, the expression of the idea or the copying of the work. Entrepreneurs and companies can register their work at www.copyright.gov. Another intellectual property is a trade secret, which is any valuable information about a product that is kept secret by an entrepreneur or company, such as ingredients or composition of a product. Applications can be completed on uspto.gov. A patent is an intellectual property that can protect an invention up to 20 years, according to Ward. An examiner will only grant a patent for an invention that is novel, useful and non-obvious. An application for a patent can be filled out on uspto.gov. “There is no legal requirement on registering an intellectual property, but it can be helpful in certain situations,” he said. Ward will be presenting information about intellectual property at 5:30 p.m. Oct. 22 at the Lima Public Library. 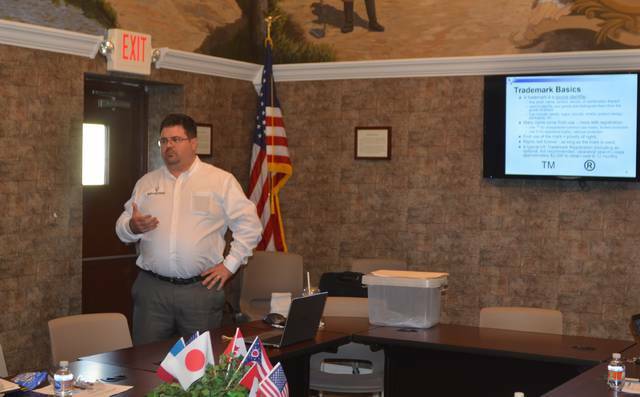 https://www.limaohio.com/wp-content/uploads/sites/54/2018/09/web1_Patent.jpgWard Law Office registered patent attorney Jacob Ward presented information about intellectual property during the “Patently Good Ideas: Intellectual Property Law for Business and Entrepreneurs” event Wednesday at the Wapakoneta Chamber of Commerce office.